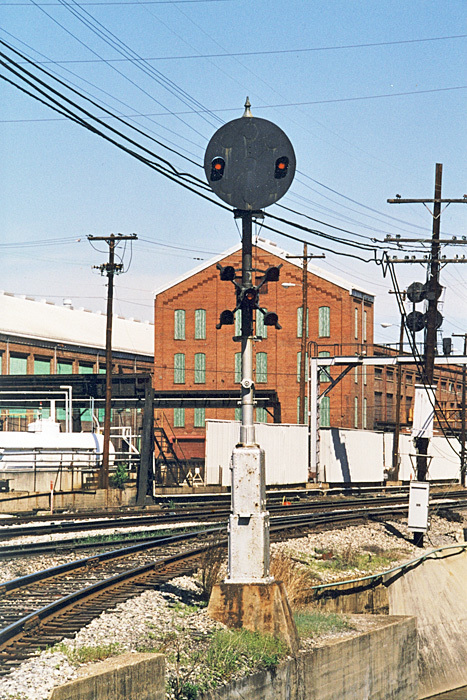 This page takes a look back at the various N&W color position light signals that have been replaced in Virginia over the years. If you have any material you'd like to contribute, please contact me at jl.hawkins@comcast.net. The signal bridge at Colley Avenue was standing tall on this bright and blustery February day. This view is looking railroad west, but compass east. A look at the westbound mast signal at Colley Avenue. This was replaced with a new cantilever signal bridge within a month of this photo. There weren't many places you could see three examples of N&W signal structures in one location. Colley Avenue offered a mast signal, full span signal bridge, and cantilever signal bridge. The nearest cantilever to Norfolk is at Webster, VA, some 248 miles away. By January 2006 the mast signal had been replaced with a new cantilever signal bridge. However the full span signal bridge had not yet been touched. 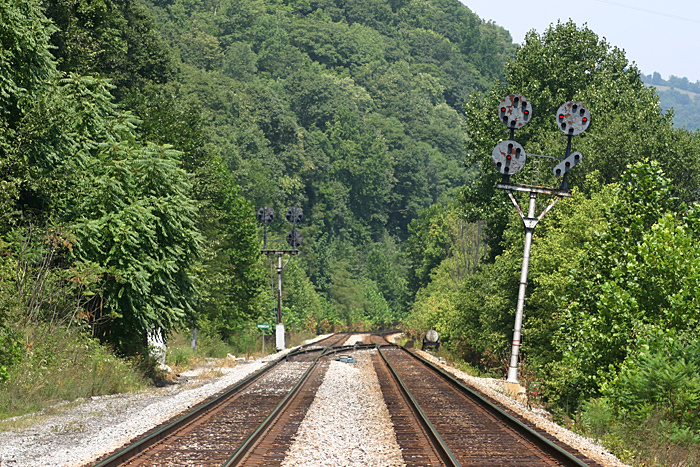 In the months following, signal crews replaced the CPL heads with Safetrans tri-light heads while leaving the signal bridge itself intact. Looking railroad east towards Lambert's Point in this view of the Colley Avenue signals. In January 2006 the Colley Avenue interlocking was still in a transition phase. The new eastbound signals had been installed but the cantilever signal bridge had not yet been removed. Also note the track on the far right has been taken up. 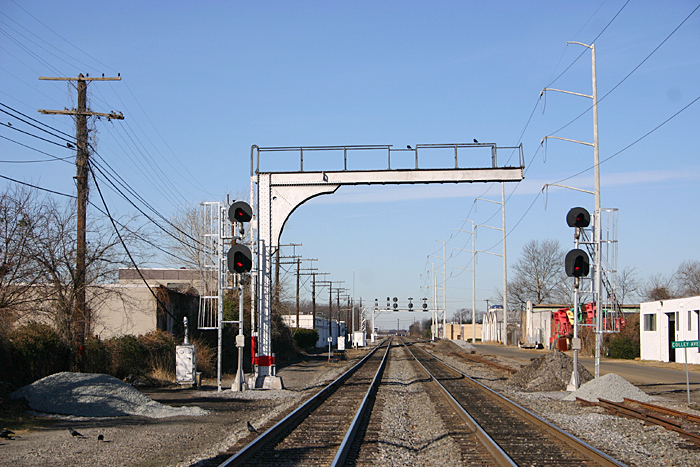 This full span signal bridge at Barre Avenue in Norfolk was replaced in mid-2003. 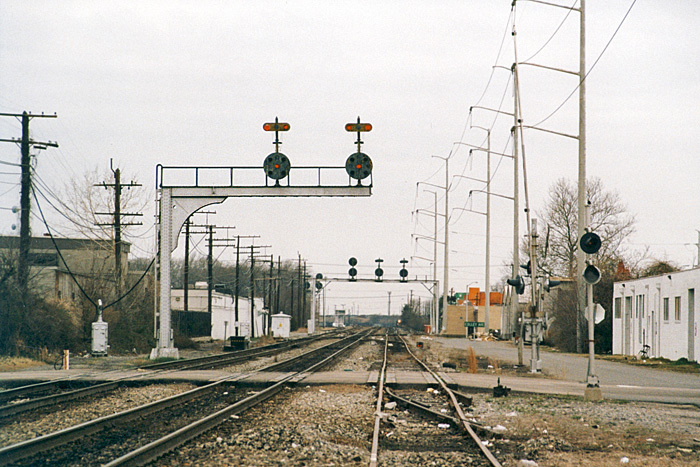 The eastbound signal at NS Junction in Norfolk was replaced in late 2003. At 3:35 AM on the morning of December 13, 2007 an eastbound coal train collided with NS 227, a westbound intermodal at the Abilene interlocking. Two locomotives and four cars from the coal train derailed along with seven cars from 227 which was impacted approximately 14 cars from the head end. Fortunately the coal train's engineer and conductor only sustained minor injuries. It was reported that it took the conductor an hour and a half to climb out of the wreckage. 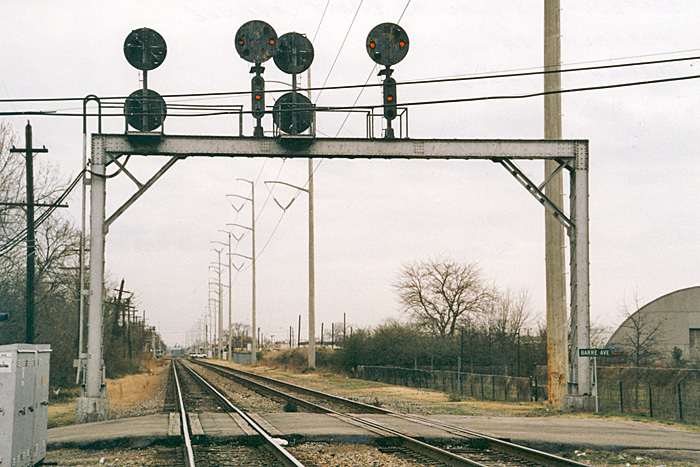 The derailment destroyed all of the N&W color position light signals at Abilene including the classic mast signal seen above. Safetrans pole signals are now in service here as seen in this photo. 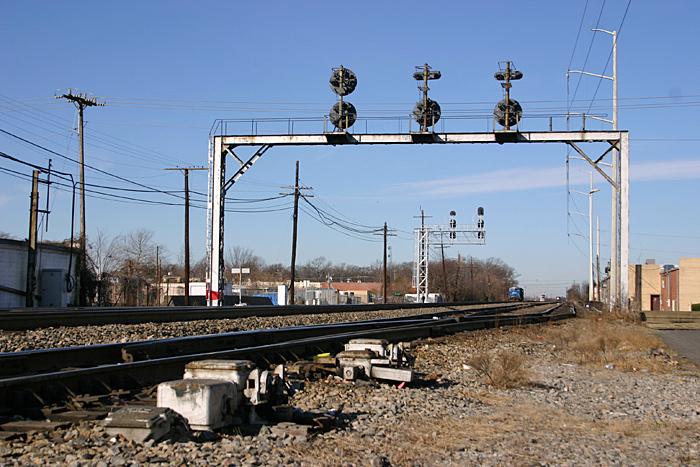 The N&W color position light signals that guarded westbound movements at Lee (MP N184) were toppled on the night of Tuesday, November 30, 2010 by high winds associated with a strong storm system. While the exact time the incident occurred is unknown, it happened sometime between when 234 and 22A ran. As 22A approached the interlocking, the crew reduced speed and stopped prior to the interlocking despite having a clear signal indication at the previous signal, Appomattox. The signals at Lee were laying over on their side, nearly in the eastbound lanes of US 460, and were still displaying a clear indication. NS signals crews quickly went to work and installed new Safetrans pole signals on Thursday, December 2, 2010. 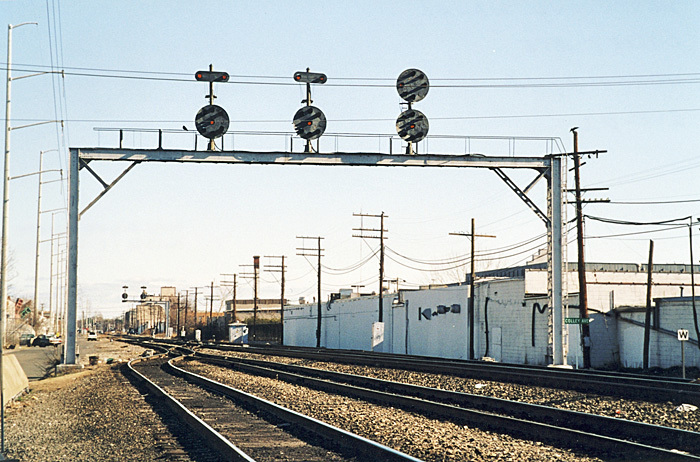 This 2002 photo illustrates the signals in better times. Even the concrete N&W mile post was replaced with an aluminum sign sometime during 2009. This unique CPL signal guarded the east leg of the wye in downtown Roanoke. It was replaced in October 2007 by a Safetrans pole signal which now stands on the opposite side of the track. To date all of the other signals on the wye are CPL signals with exception of the northbound signal off the Winston-Salem District. 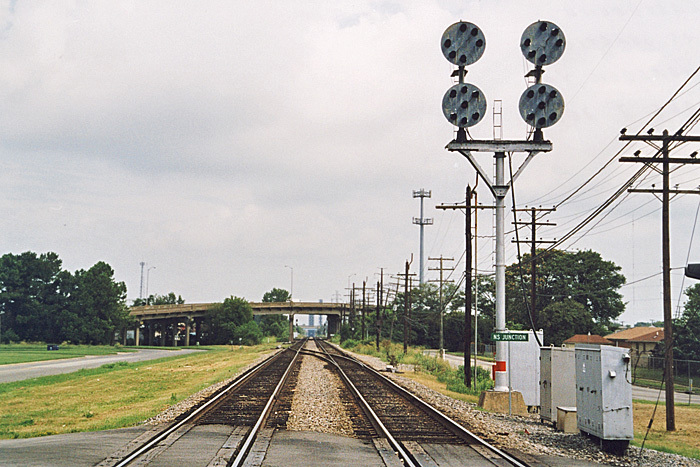 The westbound signal mast at Robinson (also called Robinson Crossover) wasn't long for the world in this 2005 photograph. It appears to be wanting to just fall down the hillside at any moment. A new cantilever signal bridge was installed in its place in early 2006.